Plywood is the key to framing curved walls. Carpenters cut curved top and bottom plates from thick plywood and laminate the plates to achieve the dimensions of standard dimensional lumber. Although standard studs are suitable for curved walls, you must bevel the edges of king and trimmer studs, which surround windows and doors, to match the curve of the wall plates. If you're anchoring the curved wall to a concrete slab, use marine-grade or pressure-treated plywood to create the moisture-resistant sill plate. Laminate structural plywood to create curved wall plates. Draw the tape measure across the long dimension of a piece of plywood. Align the tape with one of the sheet's edges. Mark the center of the long dimension with a pencil, usually 4 feet. Pound a nail into the mark with hammer. Latch the slot on the tape measure's tank over the nail's head. Draw the tape measure toward the opposite edge of the plywood until you reach the desired outside radius of the wall. Lock the tape's position at the radius. Align a pencil with the radius. While holding the pencil in position, pivot the tape and pencil across the plywood to draw a cut line that represents the outer radius of the wall plate. Reduce the tape's length by the width of one stud, usually 3 1/2 inches. Align the pencil with the new length and pivot the pencil and tape across the plywood to draw a second line that represents the inner radius of the wall. Place the plywood on a stable work surface, such as work bench or pair of sawhorses. Cut along both radius lines with a circular saw or saber saw to create a wall plate. Use the wall plate as a template for laying out and cutting subsequent wall plates. The overall thickness of the laminated plywood plates must satisfy local building codes. Align separate plywood plates and join them with a hammer and nails. Mark the spacing of studs on the plates with a pencil and framing square. 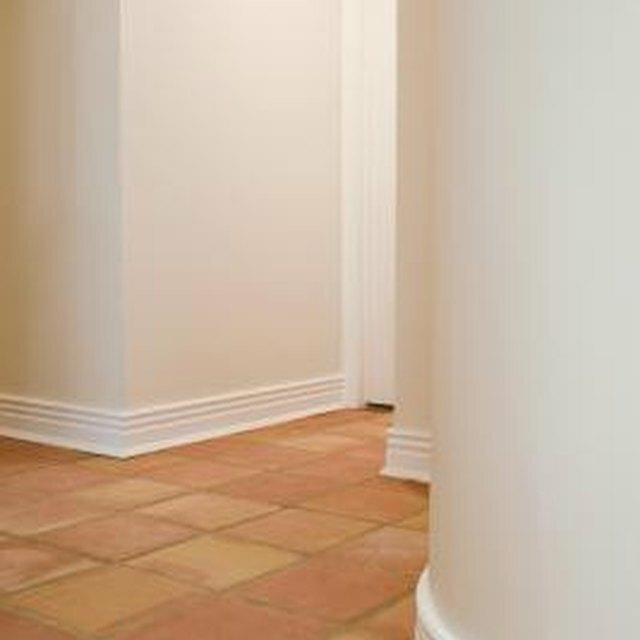 Spacing for curved walls is usually less than spacing for straight walls; consult your designer or local building authority for stud spacing requirements on load-bearing walls. Tilt the bottom plate onto its outside edge. Have a partner hold the plate to keep it from rolling. Nail studs to the bottom plate with a hammer and nails, beginning at the plate's center. Follow the nailing requirements specified by your local codes, usually two sinkers per stud. Fasten the remaining studs. Align the top plate with the loose end of the studs and have a partner stabilize the plate's position. Nail the studs to the top plate, beginning at the plate's center.